A look at the Star Conflict FAQ indicates rather strongly that the free-to-play space combat MMO focuses primarily on PvP action, with PvE present but relegated to the status of something you can do but probably won't find very interesting. The newly-announced " Invasion Mode " may change that to some extent, however, by introducing an AI-controlled enemy that can appear anywhere, at any time. The new Invasion Mode is based around the reappearance of an alien race that, for reasons unknown, disappeared into another dimension of space and time and has now found its way back home. But instead of coming back with souvenirs and good stories, they're heading up an invasion, also for reasons unknown. But it doesn't sound like the kind of overwhelming, Freespace 2 -style onslaught you might expect. 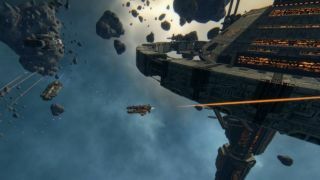 "The inclusion of Invasion Mode into the virtual world of Star Conflict provides a unique and unpredictable game dynamic that introduces more variables to the player's space combat experience," explained Stanislaw Scorn, director of Star Conflict studio Star Gem. "Not only do players have to worry about PVP attacks in the free-to-explore environment, but alien ships can suddenly appear close to player's own ship without warning, forcing them to make the lightning quick decision to flee or fight." Star Conflict's Invasion Mode will be in closed beta until the end of summer, but access will be granted to anyone with either the Strikeforce Prometheus or Universe Conqueror achievements. You can earn them, and thus access, any time between now and the end of the beta, but until you do, the doors will remain firmly closed. If you don't feel like fighting for it, you can also buy your way in with the purchase of 6000 Galactic Standards—a more efficient way to go about it, I suppose, but not nearly as much fun.